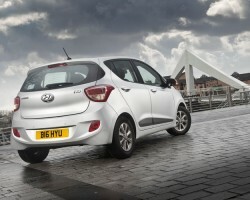 Hyundai's remarkable new i10 proves to be just as impressive back home as it was on first acquaintance. Good points: supremely quiet at all speeds, superb gearbox, great seats, competitive pricing, good looks. Not so good: rear space tight, slightly gutless engine. Rivals: Renault Twingo, Skoda Citigo, Volkswagen up! Motoring journalists have what is, on the face of it, a very glamorous lifestyle. We won't try and play any sympathy card by talking about endless flights, associated M25 grinds and numerous, 'we-need-copy-ten-minutes-ago' deadlines, because driving flashy cars in sunny climes is more than enough of a pay-off - and we even make a living out of it if we're really lucky. Sometimes, however, what seemed like a good car on some faraway hot shore can turn out to be a total duffer when you're taking on one of those aforementioned M25 slogs. Our fear was that the Hyundai i10, which we became acquainted with last year on a Mediterranean island, would turn out to be one of these motoring holiday romances - great while away, not so good in the UK. Happily, the reverse is true. 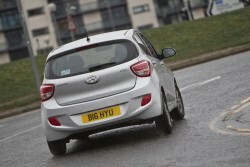 Hyundai's new city car has proven itself to be even better than we first thought. And now we've covered the best part of 500 miles in a mid-range 1.0 SE model. It's so good, in fact, that it's the first thing we'd recommend in the A-segment - and when you consider it's up against the darling of the moment, the Volkswagen up!, you realise that's high praise indeed. 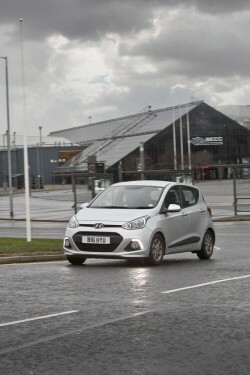 As an SE, the i10 1.0 - the three-pot derivative expected to take three-fifths of sales here in the UK, compared to its 1.2-litre four-cylinder big brother's 40 per cent - comes on 14-inch steel wheels as standard and without the LED running lights of the top-spec Premium version. Yet it's still a great-looking car, inside and out. Our only complaint is the one we raised at launch, regarding the rear styling that looks like the original XP10 Toyota Yaris. We're not sure why Hyundai couldn't render it in another way, but other than that it's a sharp machine. The seats are smashing in the i10 and with the exception of the trip computer display in the speedo - an old-fashioned digital read-out - everything else looks crisp and modern, including the entertainment screen in the dash. OK, it can't display iTunes artwork, but at least it's clear with a decent font. 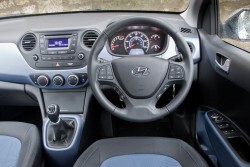 Our car was fitted with just two options, metallic paint (£455) and the excellently-priced Connectivity Pack, which adds Bluetooth, voice recognition, rear speakers and steering-wheel stereo controls for just £175. One minor annoyance, though - when playing an iPod on random through the car's standard-fit USB port, every time you turn off the ignition you have to select 'random' again and start the music over. Other cars we've tried recently just keep playing the original playlist. Anyway, so far, so good. You're in a car that costs £9,925 all in and features air conditioning, Bluetooth, electric windows all round, remote central locking, electric mirrors, a USB connection and CD player, trip computer and voice recognition. But on the move it's even more amazing. Sure, the 1.0-litre normally aspirated engine is a bit gutless thanks to the limited peak power being up near the 6,500rpm redline - and peak torque coming in at 3,500rpm - but it is at least charismatic. And it is so, so quiet and velvet smooth, at all revs. Motorway cruising at 70mph registers the same busy revs as that maximum torque figure, but the i10 is claimed to be 6dB more hushed than any rivals. As decibels work on a logarithmic scale, 6dB is not just a bit less noisy but actually quieter by something like a factor of five. 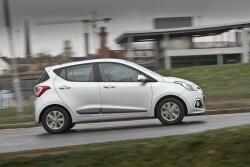 So the i10 is massively more refined than you'd expect, which makes it hugely capable on long journeys. Off the motorway, it has a competent chassis that allows you to maintain as much of your hard-won speed as possible, with minimal roll and a predominantly neutral cornering stance. The brakes are good, the steering surprisingly excellent (OK, we doubt Porsche will be stripping an i10 rack down to get any pointers but it's still much better than required in this sector) and you won't encounter many finer gearchange actions than the super-slick five-speeder. It's a total delight. Furthermore, the ride remains compliant at all times and, driving entertainment or not, the i10 meets all its key briefs so well that you can't help but adore it. Flaws? Well, the back seats are a little cramped if six-footers are up front, while it can get knocked off course in heavy side winds on motorways - which is only when it feels like a properly 'small' car. The rest of the time you'd be forgiven for thinking you were driving something as mature as a Golf. The final point is that we averaged 53.5mpg over 450 (mostly steady motorway) miles in the i10, which is short of the quoted 60.1mpg combined figure, but for something with a minuscule petrol engine it's not bad at all. Our advice is that if you're looking for a hatchback in either the A- or B-segments, it'd be foolish not to consider the Hyundai i10. It's an exceptional effort from the Koreans and we heartily approve. 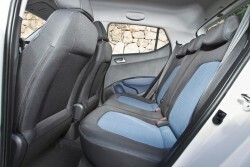 Renault Twingo: a new version is due with rear-wheel drive and a rear-mounted engine, which promises to make it a leftfield alternative to the i10. 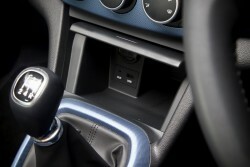 Skoda Citigo: same car as the up! but less money, more spec and great aftersales support provided by a brand which has many satisfied customers. Volkswagen up! : if you can live with the bloody stupid exclamation mark and daft trim names, one of the class leaders in the A-segment market.